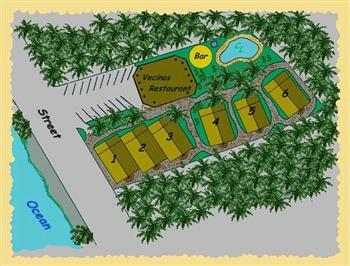 Vecinos is not only a great beachside condo resort, but also makes money! by attracting vacationers who are happy to pay you to share it with them, it generates vacation rental revenue. Crunch the numbers.You may already be able to afford it. Right now. What are the TOP Benefits of Buying Vecinos ??? 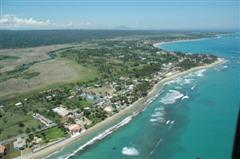 Ideal location, Location, LOCATION at the edge of the world renown destination, Cabarete, it's in one of the top 5 hottest selling real estate areas of the DR. Completed construction + ready to go - 4 completed condos and the renovated house provide 8 bedrooms and 8 bathrooms which are generating rental revenues right now. Plus the open-air retail space, ideal for a myriad of potential businesses, also already generating income. The land alone, is steadily appreciating. Since we purchased it in 2004, it has more than quadrupled in value. Top luxury projects (5 and 6 star ******) developing around us, will push that value even higher. More than 4000 meters allow you flexibility to expand the business by building more condos, or simply capitalize on what's already finished, and turn-key ready. = currently offered at almost HALF the previous list price, it's Beyond A VERY GOOD BUY !!! Return On Investment potential is upwards of 75%, using our cost of construction + listed price - details available on request. Excellent re-sale value and the increased market demand, (pushed by retiring baby boomers + others finding our "still affordable" Caribbean realty) means your re-sale value is maximized, making it a great investment property to sell later. Take your time, relax and enjoy, as your investment value continues increasing. Next best thing to a "money-back guarantee"
We offer financing to a qualified buyer, contact us for details. If you'd like to see more properties, let us know as we have contacts who have all the available listings on the north shore. Just tell us what you're looking for, and we'll search through the many homes for sale to find your best match. Ask about a FREE STAY @Vecinos for property shoppers!